Feeling guilty about your midday snack… and your midnight snack? Don’t be so hard on yourself. Snacking can be good for you. It can provide a boost of energy, decrease hunger between meals, prevent overeating at mealtime and help people with diabetes regulate their blood sugar. Apples and raisins can help ward off heart disease and stroke, but all fruits contain essential vitamins, healthy carbs and fiber. Think fruit is boring? Mix things up by making a fruit salad, or try freezing bananas and grapes for a refreshing snack on hot days. For canned fruit, choose brands that are packaged in natural juice. Because angel food cake doesn’t include egg yolks, butter or oil, it’s a healthier option than most baked goods. It does, however, contain sugar and flour, so limit yourself to a thin slice. Cocoa contains flavonoids, antioxidants that help protect us from environmental toxins. Medical researchers believe it might also improve heart health by lowering blood pressure and improving blood flow. Milk chocolate contains fewer flavonoids and more sugar than dark chocolate, so choose products that are at least 70% cocoa, and eat in moderation. Top it with fruit and nuts, and look for a brand that’s low in sugar. To make a frozen treat, blend yogurt and fruit before putting it in the freezer. It’s a whole grain and is loaded with polyphenols, an antioxidant that can reduce your risk for heart disease and certain cancers. Loaded with protein and healthy fats, nuts are good for you and easy to eat on the go. They’re also high in calories, and the prepackaged varieties are usually salted, so limit yourself to a handful and choose low-sodium versions to make sure you’re getting heart healthy snacks. 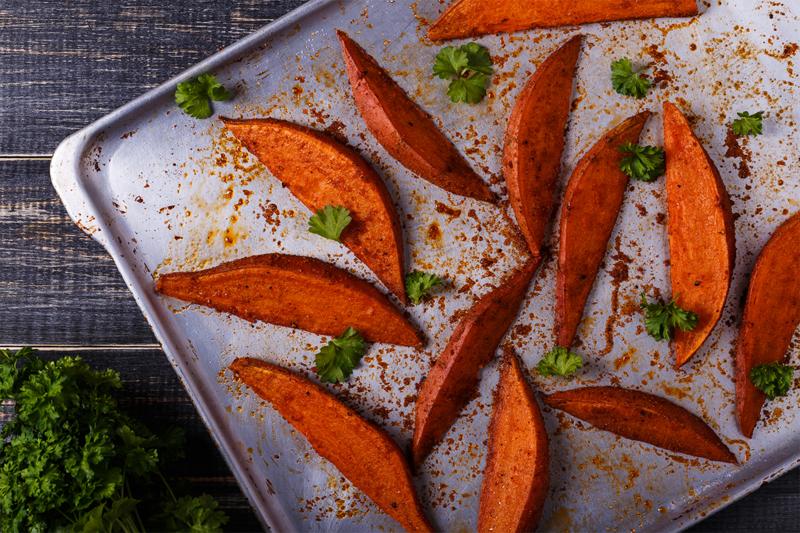 Sweet potatoes contain a variety of essential vitamins and minerals. They’re also a good source of potassium and fiber. Put it on whole-grain toast, apples, bananas or celery. Top them with canned tuna or salmon or with low-fat cheese. Skip the chips and dip veggies instead. Instead of buying the sodium-heavy prepackaged varieties, make your own using nuts, raisins or other dried fruits, and whole-grain cereals. Top a whole-grain English muffin with a moderate amount of shredded low-fat mozzarella, tomatoes, oregano and any other veggies you have on hand. Looking for meals made with heart-healthy foods? Try these recipes.